Here are a few bits and pieces that don’t really fit anywhere else. 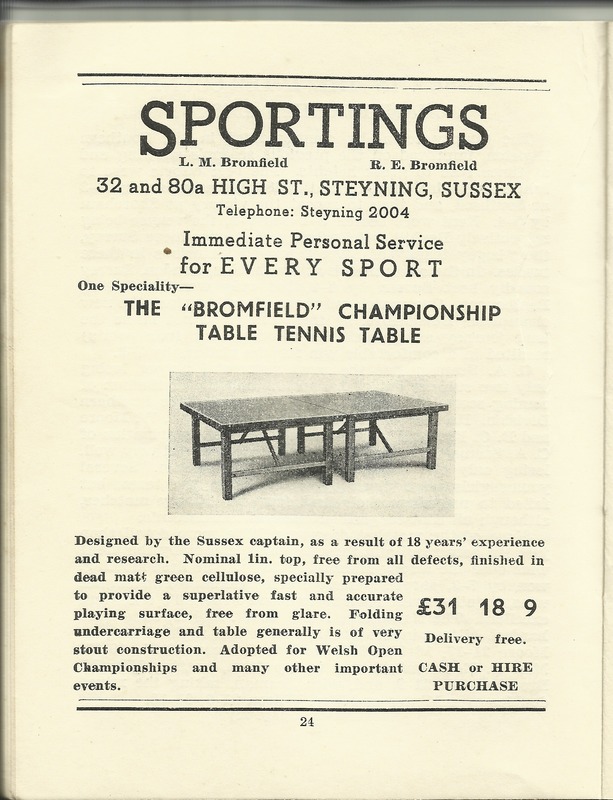 Above is an advertisement I found if you wanted to buy your own table, along with an article about Table Tennis – The Service Shot. An article which details circumstances culminating in a crisis which threatened the very existence of organised table tennis. I have transcribed the article below. 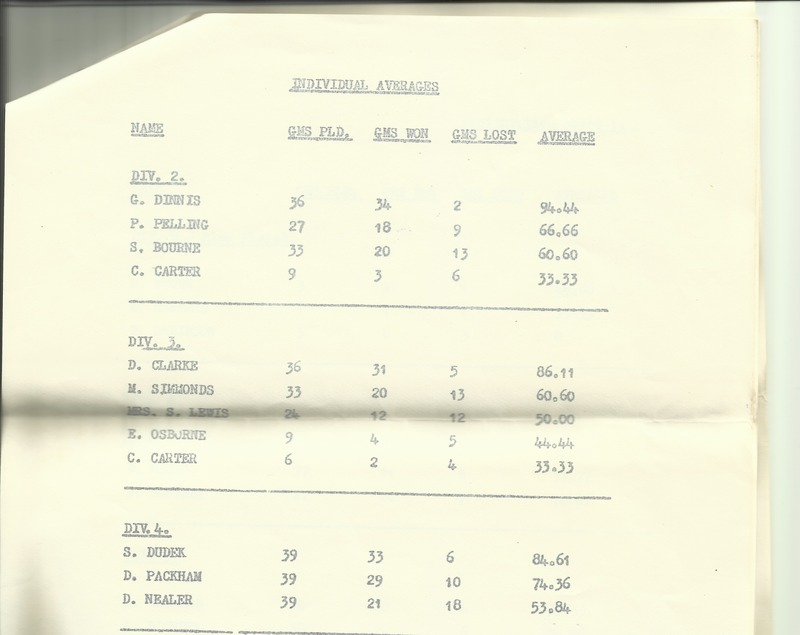 Below is the Alliance Sports Club Table – Tennis Section – Season 1968/69 mid season report from December 1968. It states that “in every division except Division 6, we have at least one player ‘in the averages’ (i.e. 75% and higher). In particular, Gordon Dinnis (Div 2) and Jackie Lord (Div 8) both have well over 90%. In the individual averages we see Gordon Dinnis at the top of Division 2: Played 36, Won 34, lost 2. Average 94.44%. 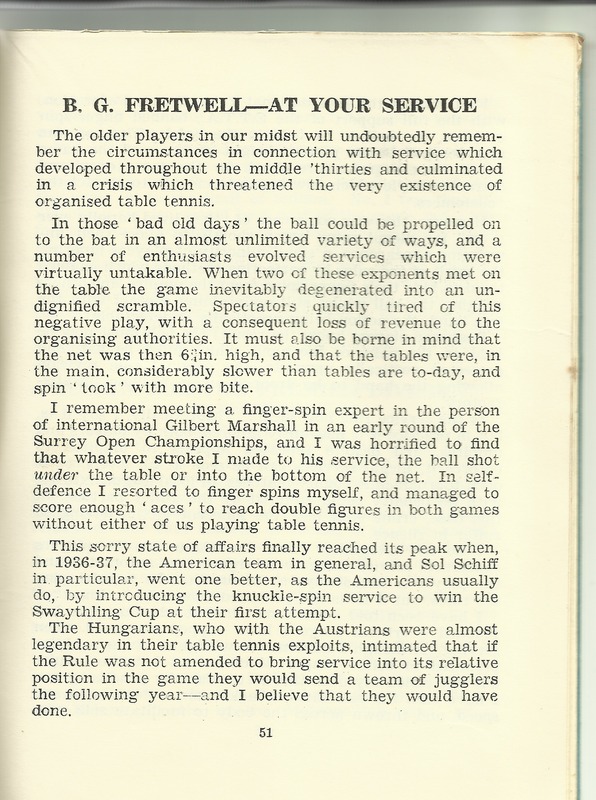 The older players in our midst will undoubtedly remember the circumstances in connection with service which developed throughout the middle ‘thirties and culminated in a crisis which threatened the very existence of organised table tennis. In those ‘bad old days’ the ball could be propelled on to the bat in an almost unlimited variety of ways, and a number of enthusiasts evolved services which were virtually untakable. When two of these exponents met on the table the game inevitably degenerated into an undignified scramble. Spectators quickly tired of this negative play, with a consequent loss of revenue to the organising authorities. It must also be borne in mind that the net was then six and three quarters inches high, and that the tables were, in the main, considerably slower than tables are today, and spin ‘took’ with more bite. I remember meeting a finger-spin expert in the person of international Gilbert Marshall in an early round of the Surrey Open Championships, and I was horrified to find that whatever stroke I made to his service, the ball shot under the table or into the bottom of the net. In self-defence I resorted to finger spins myself, and managed to score enough ‘aces’ to reach double figures in both games without either of us playing table tennis. This sorry state of affairs finally reached its peak when, in 1936-37, the American team in general, and Sol Schiff in particular, went one better, as the Americans usually do, by introducing the knuckle-spin service to win the Swaythling Cup at their first attempt. 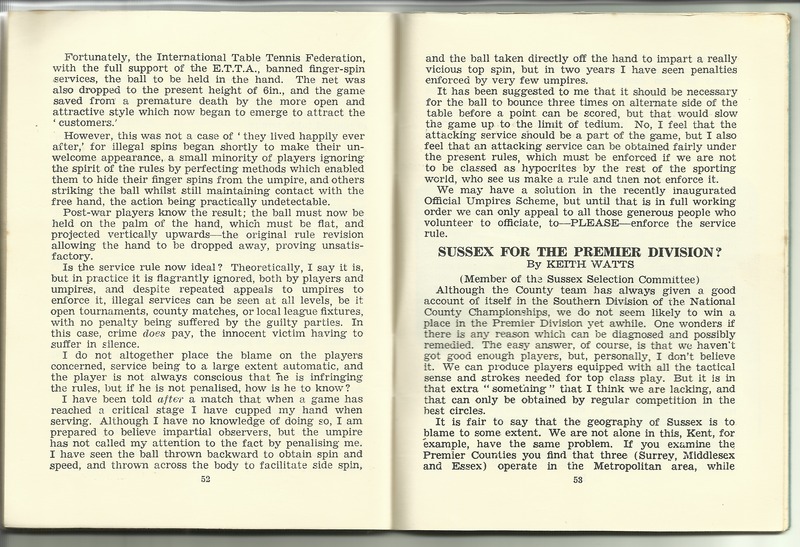 The Hungarians, who with the Austrians were almost legendary in their table tennis exploits, intimated that if the Rule was not amended to bring service into its relative position in the game they would send a team of jugglers the following year – and I believe that they would have done. However, this was not a case of ‘they lived happily ever after,’ for illegal spins began shortly to make their unwelcome appearance, a small minority of players ignoring the spirit of the rules by perfecting methods which enabled them to hide their finger spins from the umpire, and others striking the ball whilst still maintaining contact with the free hand, the action being practically undetectable. Post-war players know the result; the ball must now be held on the palm of the hand, which must be flat, and projected vertically upwards – the original rule revision allowing the hand to be dropped away, proving unsatisfactory. Is the service rule now ideal? Theoretically, I say it is, but in practice it is flagrantly ignored, both by players and umpires, and despite repeated appeals to umpires to enforce it, illegal services can be seen at all levels, be it open tournaments, county matches, or local league fixtures, with no penalty being suffered by the guilty parties. In this case, crime does pay, the innocent victim having to suffer in silence. I do not altogether place the blame on the players concerned, service being to a large extent automatic, and the player is not always conscious that he is infringing the rules, but if he is not penalised, how is he to know? I have been told after a match that when a game has reached a critical stage I have cupped my hand when serving. Although I have no knowledge of doing so, I am prepared to believe impartial observers, but the umpire has not called my attention to the fact by penalising me. I have seen the ball thrown backward to obtain spin and speed, and thrown across the body to facilitate side spin, and the ball taken directly off the hand to impart a really vicious top spin, but in two years I have seen penalties enforced by very few umpires. It has been suggested to me that it should be necessary for the ball to bounce three times on alternate sides of the table before a point can be scored, but that would slow the game up to the limit of tedium. No, I feel that the attacking service should be a part of the game, but I also feel that an attacking service can be obtained fairly under the present rules, which must be enforced if we are not to be classed as hypocrites by the rest of the sporting world, who see us make a rule and then not enforce it. We may have a solution in the recently inaugurated Official Umpires Scheme, but until that is in full working order we can only appeal to all those generous people who volunteer to officiate, to – PLEASE – enforce the service rule. 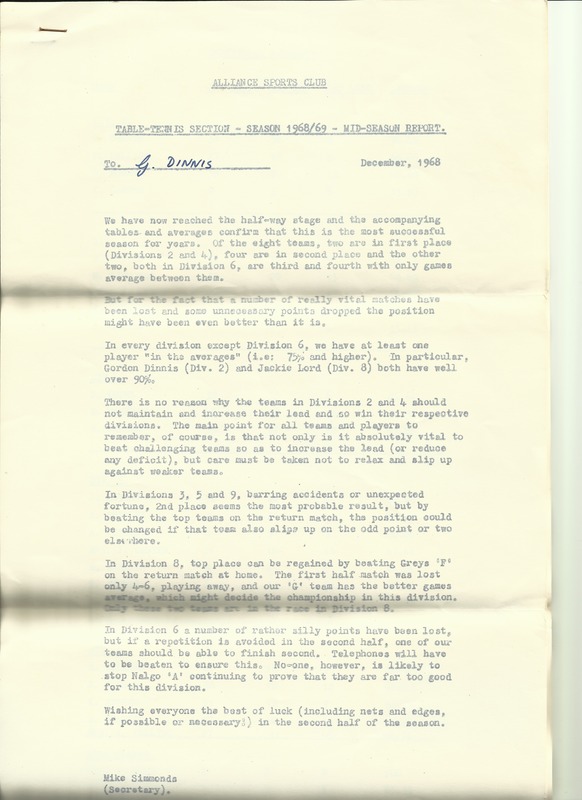 This entry was posted in Enid May Howells, Gordon Charles Dinnis, SPORT, Table tennis and tagged History, Table Tennis. Bookmark the permalink. That’s great. I love the seriousness of it all. And why not? Athletes are so serious about other sports!